What does it take to raise your first million dollars of investment capital? Do you need to be friends with someone rich… or do you just start knocking on doors? Bobir Akilkhanov is barely in his 30’s, yet, has already made ENORMOUS strides as an entrepreneur! Bobir’s current consultancy The Real Start works with Lasik, APT Systems, Museum of Modern Art, Peter Neilsen and dozens of other start ups to well established companies, that come to him with an idea or concept, and he helps to turn it into a multi-million dollar successes. [2:30] – Meet this Week’s Guest, Bobir Akilkhanov! [3:45] – Bobir’s Secret Recipe for Success! [8:30] – How to Raise a Million Dollars. [9:45] – Losing BIG in Russia, Regrouping, and Coming Back Stronger than Ever! [16:00] – A Tough Change in Regulations Forces Bobir to Re-adapt and Start Something New. [18:00] – Taking Risks – The Good, The Bad, and a Couple of Oversights. [21:45] – What Going BROKE 3x Teaches an Entrepreneur. 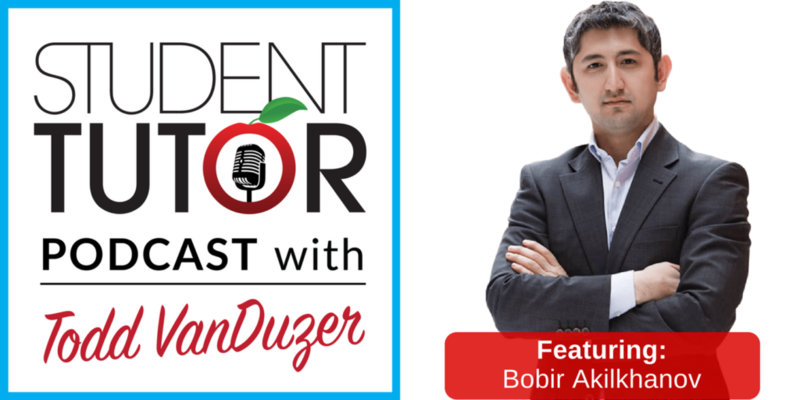 [26:30] – Bobir’s #1 Piece of ACTIONABLE Advice for Teenagers! [27:30] – Todd Reviews Key Points of the Interview. [28:45] – Questions from the Student-Tutor Mastermind Members! 1. Believe in what you’re doing and have confidence in your mission! Develop public speaking skills, and develop STRONG relationships with people along the way! 2. Be ready to take ACTION when opportunity presents itself! Be ready to jump in and take risks if they fit your goals and values! Try adapting PROVEN business models to expedite your success! 3. Failure gets EASIER each time! Start young! Keep pushing forward and you’ll eventually grow an immunity to failure’s effects! Never give up, life goes on!